Just Say No…to WORD VERIFICATION!!! Last year, during Shoot and Edit, Jill Samter and I teamed up to get rid of captcha’s…or word verifications. For a while, it seemed as if our efforts were working – word verification seemed to disappear. Unfortunately, I have seen a huge increase in word verifications popping up all over the blogosphere. So, I beg you…TURN OFF WORD VERIFICATION! For one, I try to visit a lot of blogs (probably not as much as I once did since the baby has zapped a lot of that energy, but definitely on Sunday for the Scavenger Hunt), and it takes too long trying to spell out weird words. Most times I have no clue what the letters are – which means I have to type in words more than once…especially now that part of the captcha is blurred out. If you’re like me, the word verification thing really hampers your ability to visit and comment on other people’s posts. If you could just check your own site to see if you’re an offender and then remove it, that’d be great. Just in case you don’t know how to turn it off (and you’re in blogger) – go to your dashboard. Click on Settings….then click on Post and Comments (to lower your spam comments check off Registered Users like you see below). I personally allow anyone to comment, and blogger does a pretty good job of weeding out the anonymous users from my comment feed. Now, scroll down to where you see show word verification and select no. You may have to switch back to the old blogger interface to access this page since it’s not available in draft.blogger.com. Just got up to the right hand corner of your screen and click on the symbol that indicates settings (it’ll be beside the language button). Click on the option for the Old Blogger Interface and look for Settings and then Comments. Make the adjustments as you see below and save your changes. You can adjust how often you moderate comments. I don’t mind if you moderate all comments as long as I don’t have to complete the word verification. I personally only moderate comments older than 14 days. I guess it’s really up to you whether or not you make this adjustment, but I do know that you’ll see an increase in comment traffic if you simply remove word verification. If nothing else, you’ll make me happy…that should count for something right? And if you want to join the movement, feel free to copy/past the button below onto your blog. Spread the word – let’s get rid of word verification one blogger at a time! While we’re here, let’s also discuss a couple of other things that would really make yours and my blogging experience more collaborative. 1. Turn on your email addresses so that when you leave me a comment, I can reply back to you directly. Ideally, I would love to return visit everyone who visits my page, but let’s be honest…that doesn’t always happen. However, I would at least like to respond back to your comment to let you know I’m here. You can reply via email to my comments I leave on your blog because I’ve included an email address on my blogger profile. Rather than seeing noreply-comment@blogger.com when I try to respond to you, it’d be great to have your email address. In fact, did you know that if you don’t have your email linked to your profile, GMAIL links all noreply-comment@blogger.com comments together so it looks like one big blob of comments. It’s almost easier to just hit delete than to try to return-visit those bloggers. The steps are rather easy. Once fix the “no-reply@blogger.com,” others will be able to email you if they choose for comments to hit their in-box. Edit your profile and enter your email address under the Identity section, then click on the box next to “show my email address” under the Privacy section. 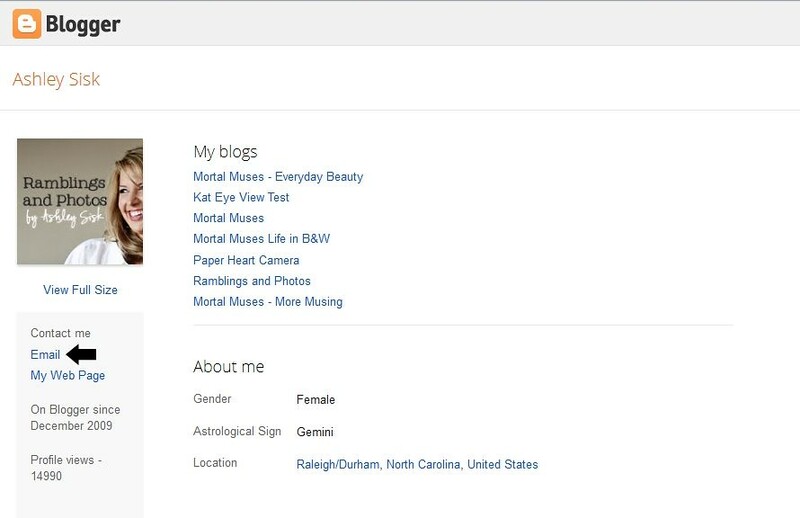 This will provide a link on the profile page that says “Email” and a person could click on that to email them directly. 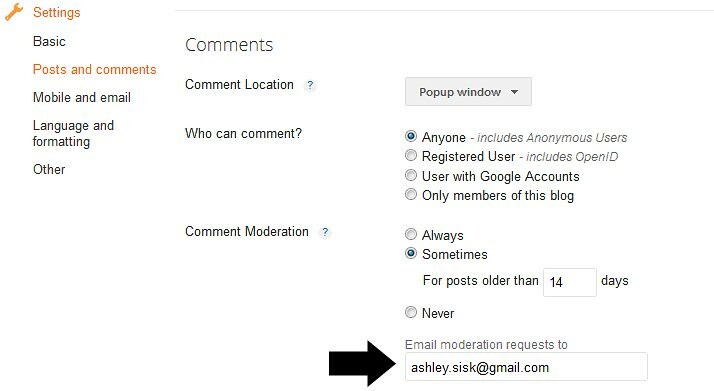 This also provides a legit email address a blogger can reply to when responding to a comment left on their blog! As you can see in my example below, I used Jill’s original message and image. With Google +, this may look a little different, but you can still edit your profile to include your email address…even hide it from the sender so your email doesn’t get thrown into some sort of junk mail vendor’s hands. Make sure your profile looks like this to enable others to email you back once your comment has been emailed to them. 2. If you want to have comments left on your blog emailed to you – simply follow the steps above to turn off word verification and then add in your email address where you see it below. Then click save. If you still get any unwanted comments simply turn on comment moderation and do not publish any that you do not wish to show. 3. Finally, I have just to point out to bloggers who may respond to comments on their blog…in most cases, your responses are never read by the original commenters. Personally, after I’ve visited a blog and left a comment, I move on and don’t return to see if the blogger responded to me. I do know that Blogger has enabled some WordPress/TypePad types of applications that allow you to comment directly on your blog, but that only works in certain browsers. Just thought I’d give you a head’s up. Alright, that’s all folks. Have a great day and spread the word!